Visitors come to Portland for many reasons, but just about all of those reasons come together in the Portland Saturday Market. Within the confines of one weekly event, you have tasty food to munch on, live entertainment, arts and crafts, a touch of quirk, and a view of some of Portland’s many bridges. Like Portland itself, the market is informal, laid-back, and a lot of fun. Whether you’re there to hop your way between food vendors, search for the perfect gift, or just want an interesting place to stroll, you’ve come to the right spot. 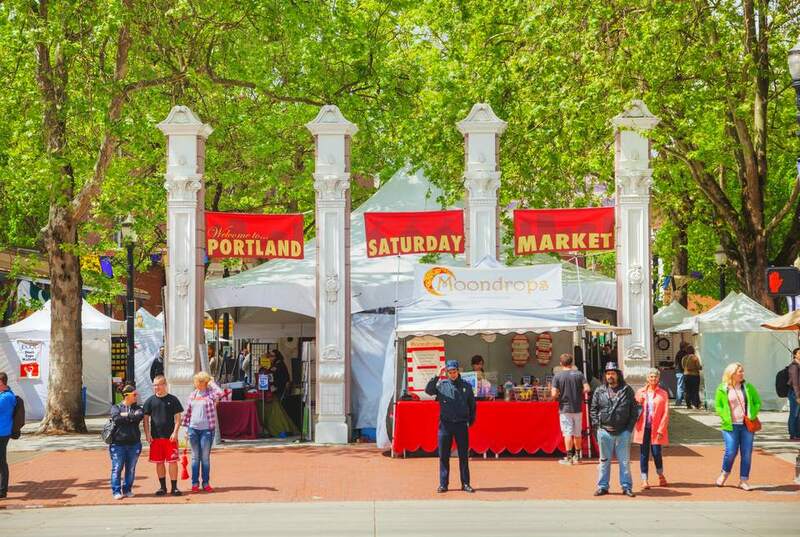 While the name Portland Saturday Market might lead you to believe this market only sets up shop on Saturdays, think again. From March until Christmas Eve each year, the market is open on Saturdays from 10 a.m. to 5 p.m. and Sundays from 11 a.m. to 4:30 p.m. The market is located at 2 SW Naito Parkway in Waterfront Park, right along the Willamette River (hence the nifty view of all the bridges). It’s easy to get to no matter what kind of transportation you seek to use. There’s bike parking near the red info trailer as well as near the main stage. Both the MAX light rail and TriMet bus system have stops close to the market if you want to avoid having to park (always a solid decision). You can, of course, drive to the market too, and there is metered street parking and several parking garages in the area. If you park in the SmartPark garage and buy at least $25 from the market, you can get your parking validated for up to two hours. The Portland Saturday Market was started by two artists, Sheri Teasdale and Andrea Scharf. The two women had been vendors at the Saturday Market in Eugene and decided Portland needed something similar. In late 1973, Teasdale and Scharf rounded up all the artists and vendors they could with the idea of creating an open-air market that would allow artists and food vendors to sell their wares, and shoppers to find a solid variety of locally made things to buy and eat. Originally, the Portland Saturday Market was indeed a Saturday market, but in 1976 it started staying open on Sundays too. It kept the name just because Portland likes to be quirky like that. The market has had more than one location over the years. In 1976, it opened under the Burnside Bridge and stayed there for 34 years before construction in that area moved the market to its present location in Waterfront Park. It’s been at Waterfront Park since May 2009. Today, the market has more than 350 members, brings in a whopping total of $8 million in gross sales each year, and attracts one million locals and visitors ever year too! Besides getting something to eat, the number one thing you shouldn’t miss during any visit to the market is checking out the vendors. There are more than 350 vendors who participate in the Portland Saturday Market, so there’s a ton of variety. You’ll find the usual woodworkers, pottery, jewelry makers, and other artisans, as well as plenty of vendors you might not expect, including those selling stationary, baby slings, handmade puzzles, novelty boxer shorts, and handmade cutlery. You name it, and someone is selling it at this market. Live music and entertainment are also regular fixtures on both Saturdays and Sundays. The market’s Main Stage features musicians who play original music, usually acoustic, during most of the open hours. Enjoy the tunes floating through the air or kick back near the stage with a snack from one of the food vendors. Finally, if you have kids in tow, also check out Kids’ Korner. Kids’ Korner brings in fun activities for the younger market visitors. One week, the Portland Art Museum might lead the activities, while other weeks might bring in a puppet show or holiday activities. The lineup changes regularly. Ah, this is what we’re all really here for. Portland is known for its food scene, and the Saturday Market is a slice of that. The food vendors at the market serve up a huge variety of foods from around the world. For a snack while you walk around, try an empanada from PDX Empanadas or a gyro from Angelina’s Greek Cuizina. If you’re looking for a hearty meal, you’ll find international cuisine, including Nepalese, Thai, Lebanese, and Polish. For dessert, kettlecorn or ice cream from Great NW Ice Cream should hit the spot. There are plenty of food vendors and food trucks and carts to try. The best way to go about it is to buy small things from a few of them instead of one large meal from one of them so you can try more! The market is also really close to plenty of restaurants and eateries, including the ever-iconic Voodoo Doughnuts at the corner of SW 3rd and Ankeny (though, you’ll face shorter lines at the market) and tasty breakfast joint Mother’s Bistro & Bar at 212 SW Stark Street.